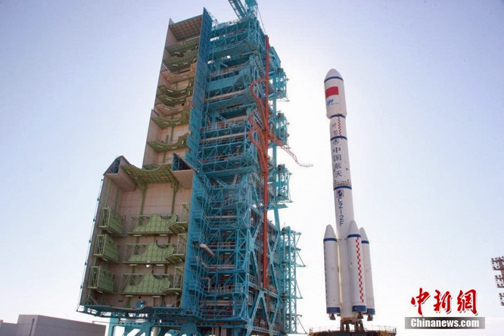 According to the the gbtimes infosite, China will launch their second spacelab Tiangong-2 from the Jiuquan Satellite Launch Centre at 14:04 universal time (UTC) on Thursday. Tiangong-2 is a prototype spacelab that will test life support, repair systems and refueling technology for the future 60-ton Chinese Space Station, the core module of which is due to launch in 2018. The launch will be broadcast live by Chinese state media, with the launch scheduled for 22:04 Beijing time (10:04 EDT) in the Gobi Desert in Northwest China. The Tiangong-2 satellite aboard the Long March 2F-T2 carrier rocket at the Jiuquan launch tower. Photo is courtesy of CNS. Wu Ping, deputy director of the China Manned Space Engineering Office, said the Long March 2F carrier rocket, which will lift Tiangong-2, is currently being filled with propellant. 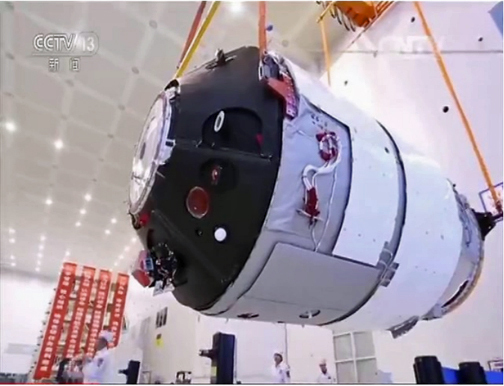 The spacelab will receive the visit of the Shenzhou-11 crewed spacecraft to accomplish the country's first medium-term stay of astronauts in orbit. Tiangong-2 will be lifted into an orbit 393 kilometers above the Earth, where the craft will be joined by the crewed Shenzhou-11 spacecraft in October. The 8.6 ton Tiangong-2, which translates to “Heavenly Palace 2,” will host two astronauts for 30 days and will also carry a range of scientific payloads, including POLAR, a collaboration between Swiss, Polish and Chinese institutions to study gamma ray bursts. Photo is courtesy of CCTV. Piggybacking on the Tiangong-2 launch will be Banxing-2, a technology development satellite made by the Shanghai Academy of Spaceflight Technology (SAST). Armed with 25 megapixel optical cameras, the small satellite will orbit close to and snap photos of Tiangong-2 and the visiting, crewed, Shenzhou-11 spacecraft. According to industry analysts, Tiangong-2 will be visited by China’s first refueling and cargo vessel, Tianzhou-1, in the first half of next year, which itself will be launched aboard a Long March 7 rocket from the country's new Wenchang spaceport. The Shenzhou-11 and Tiangong-2 missions, together, will bring China one step closer to the ultimate goal of the nation's three-step human spaceflight program, a large, permanently inhabited space station.